One of my favourite cafes in my sister's neighborhood- 3 little figs- in Somerville- has an item on the menu Ricotta Toast. It looked so good!! I decided it would be easy to replicate it back at home. 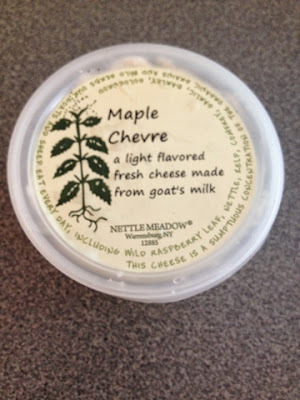 We used goat cheese instead of Ricotta and whipped it up for a quick lunch before we head off to Providence!! 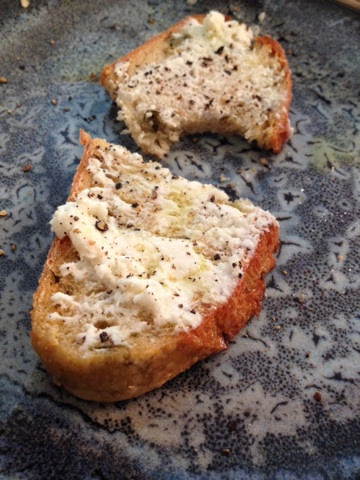 - olive oil and salt and pepper- voila!!! - Bread from When Pigs Fly. The bread is delivered daily from Maine. We used two different kinds because Claire doesn't like olives. One type with olives and jalepenos and one whole grain. - Maple goat cheese from a goat farm in upstate new york. They picked it up on a trip and had been keeping it in the freezer. - Olive Oil- from Italy- from our family friend's land! If you can't get your hands on olive oil from Italy just make sure you have an extra virgin good quality one. You usually get what you pay for when it comes to olive oil. and finally an "ordinary" pepper- Malabar black pepper from India.